Ok, this may not look like much at 1st glance, and it isn't, but this here's the beginning of a poster that I've gotten a ton of inquiries about. 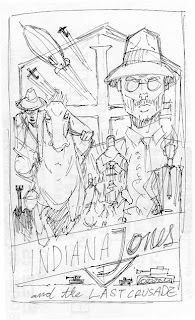 Yup, that'd be Indiana Jones and the Last Crusade, the 3rd in a series that I had no idea would even sell. I'm sure glad that the others went over pretty well and I thank all of you who have been waiting around for this one. Hopefully you'll dig it as much as the 1st two and the knowledge that the 3rd one is now on its way will keep the 'where the F is it?' e-mails at bay. The time line on this is a month or two because of prior obligations, but I'll be sure to post the progress as soon as I get into it. Because it's in chicken scratch form, here's few of the details in the layout: HUGE Professor Henry Jones Sr., Indy galloping on horse, Elsa holding Grail diary, the Grail knight, the Grail tablet, the zeppelin, fighter planes, tanks, the Castle Brunwald, and a bunch of baddies. In the end, the poster composition and color scheme is very similar to the 1st two and should sit side by side with 'em quite nicely. Enjoy!